Before Metro's new Silver Line starts rolling July 26, six days of "simulated service" are trying to mimc real-world conditions -- and permanent changes to the Blue Line began with Monday morning's rush hour. If you're an Orange Line rider, you may see trains arriving more frequently. But intervals between the Blue Line are increasing from about eight minutes to 12 during rush hour. The change is largely attributed to the width of Rosslyn tunnel under the Potomac River. It may take you a little longer to get to work this week if you take the Blue Line. Metro is in the final phase of testing trains on the Silver Line before it officially opens on Saturday. The Blue, Silver and Orange lines all meet at the tunnel, but there are only so many trains that can get through at rush hour to go into downtown D.C.
As of Monday, Blue Line trains have been reduced so Silver Line trains can get through. Trains headed to Arlington Cemetery and Rosslyn have been cut back. Metro said this week's simulated service will help "familiarize employees and finalize train schedules under real-world conditions." The Silver Line simulation trains (labeled as Orange Line trains) are running every six minutes during rush hour and every 12 to 20 minutes during off-peak times. The trains carry passengers between East Falls Church and Largo Town Center, but not to or from the five new Silver Line stations. 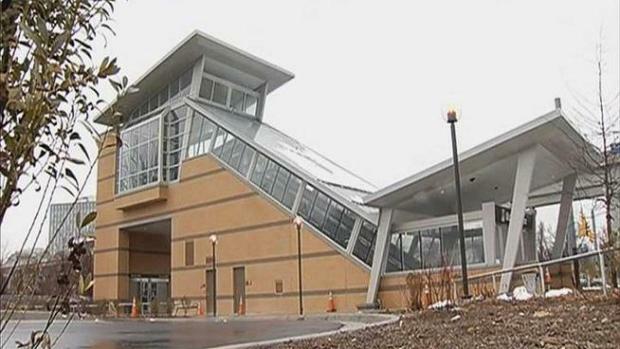 Once the train arrives at the East Falls Church Metro station, passengers will be offloaded and the train will continue to the Wiehle-Reston East station empty. According to WMATA, riders traveling between East Falls Church and Court House will see trains arrive more frequently at all times, and there will be more trains traveling from Rosslyn to Stadium-Armory outside rush hours. About a third of Metro travelers are expected to have shorter wait times thanks to the Silver Line, and 53 percent won't see much change in wait time. The 10 percent who will see longer wait times are mostly Blue Line riders, Metro said. After the test runs, five Silver Line stations -- Wiehle-Reston East, Spring Hill, Greensboro, Tysons Corner and McLean -- will open their doors at noon on Saturday, July 26. The line's first phase extends the current Metro system by 11.5 miles; riders can travel from East Falls Church through Tysons and on to Reston. Starting July 26, Silver Line trains will run every six minutes during peak hours and every 12 to 20 minutes at less-busy times. You can get an idea of fares and travel times online here. McLean (Route 123 and Scotts Crossing Road) is also accessible via the Route 123 pedestrian bridge. There's space for motorcycle parking, a kiss-and-ride area, 26 bike racks and a bus stop nearby. Tysons Corner (Route 123 and Tysons Boulevard) doesn't offer much space for drivers (no parking or kiss-and-ride area), but has a pedestrian bridge over Route 123, as well as 38 bike racks, and six bus bays to serve the station. Greensboro (Route 7 and Chain Bridge Road) features a pedestrian bridge, bike racks and a bus stop on the east side, which is served by Fairfax Connector Route 422. Spring Hill (Route 7 and Spring Hill Road) doesn't have parking, but features a kiss-and-ride area, five bus stops and more than 20 bike racks. Wiehle-Reston East (Dulles Toll Road and Wiehle Avenue) serves as the line's west end. This station comes with a 2,300-space parking garage, pedestrian bridges over the toll road, five bike rack and bus services. The Silver Line's second phase will extend to Dulles International Airport, but is not projected to open for about five years.